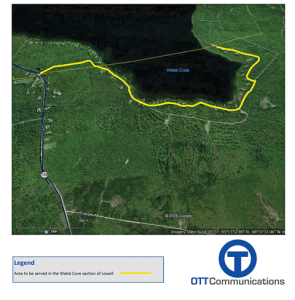 (New Gloucester, ME) – Maine-based OTELCO, a division of Otelco Inc., announced today that it has won two ConnectME Authority matching grants that will allow the company to provide high-speed fiber-optic broadband service to many unserved residents of Gray, New Gloucester and Lowell Maine. The two grants totaling $52,000 will be matched by an equal investment by the company and bring speeds of up to 150 megabits per second (mbps) to at least 138 homes, 86 of which who currently meet the ConnectME Authority definition of unserved with less than 1.5 Mbps of bandwidth. Area of Lowell, ME to be served. 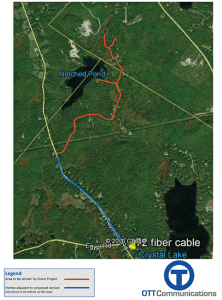 OTELCO Vice President of New England Operations, Ed Tisdale predicted that the two projects would get underway this summer and be completed in approximately 6 months OTELCO will be offering speeds ranging from 50 to 150 Mbps at very competitive prices.